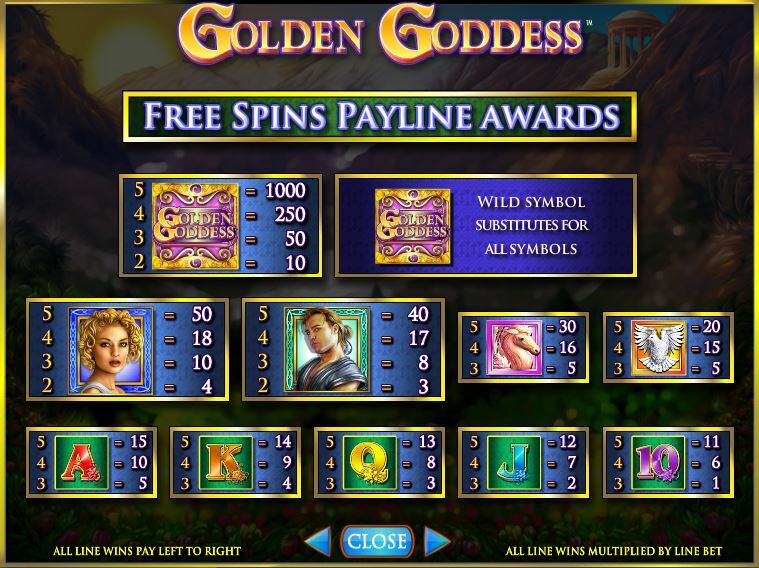 Golden Goddess is a slot machine dedicated to the goddess of beauty, to Aphrodite. With the action taking place in a beautiful setting, fit of a place where the goddess would live, it looks like IGT did an excellent job with this particular game. 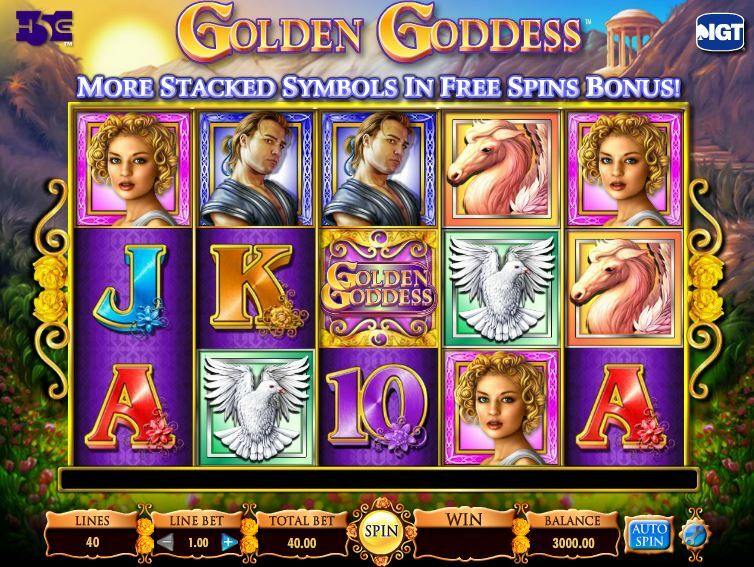 A number of IGT slots use the same system, with a lot of stacked symbols and high quality graphics, and Golden Goddess is no exception. 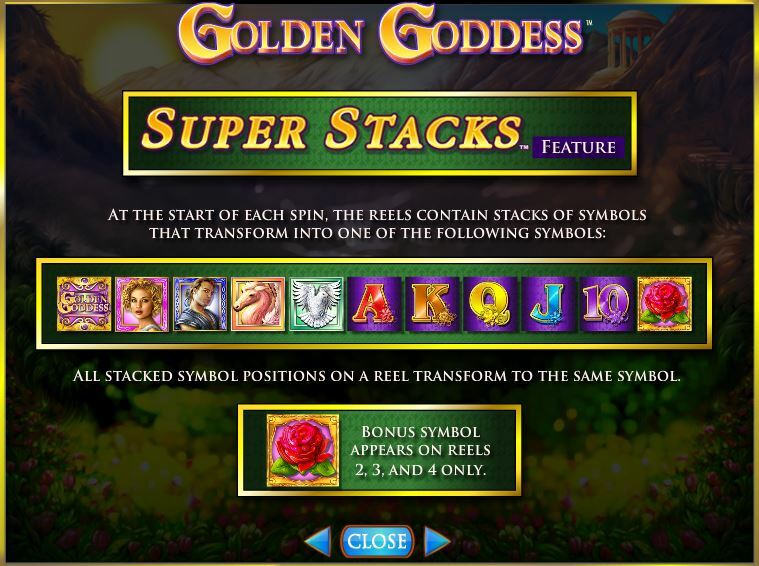 You get to place bets on 40 lines when you play Golden Goddess, and along the way you will discover that you have access to Super Stacks, to wild symbols and to scatters which will trigger free spins. With relatively expensive wagers, the game can award up to $50,000 as the top prize. 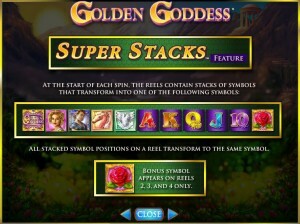 The Super Stacks feature is used in this slot, and it’s something that you only get to try in IGT titles. Bonus symbols are also present, there are wilds and you can trigger free spins. First of all, let’s take a look at the Super Stacks. These are stacks of symbols which come on all the reels, and which will transform each round into the same symbol, chosen out of the regular icons available in the slot. You get a lot of chances to form combinations of symbols, and you will often get up to 40 identical combos formed in the same round. More often than not they will be of 2 or 3 symbols, but 40 small prizes still amount to something impressive. 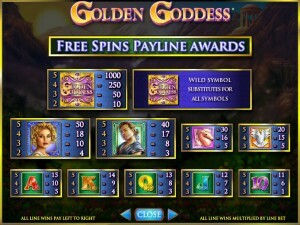 You will get the Golden Goddess Logo on the reels as well from time to time. This will be used as a wild by the game, though it will also be able to create its own combinations and give you up to 1,000 coins as a prize. As a wild, it can substitute for any other symbol, with the exception of the Red Rose scatter. The Red Rose scatter is used by the game on the reels 2, 3 and 4. 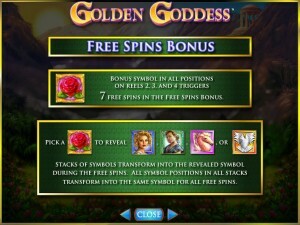 Getting it on all three reels will mean the start of the free spins, 7 of them being available. You get to choose one of the Red Roses next, and one of the high paying symbols will be revealed underneath. 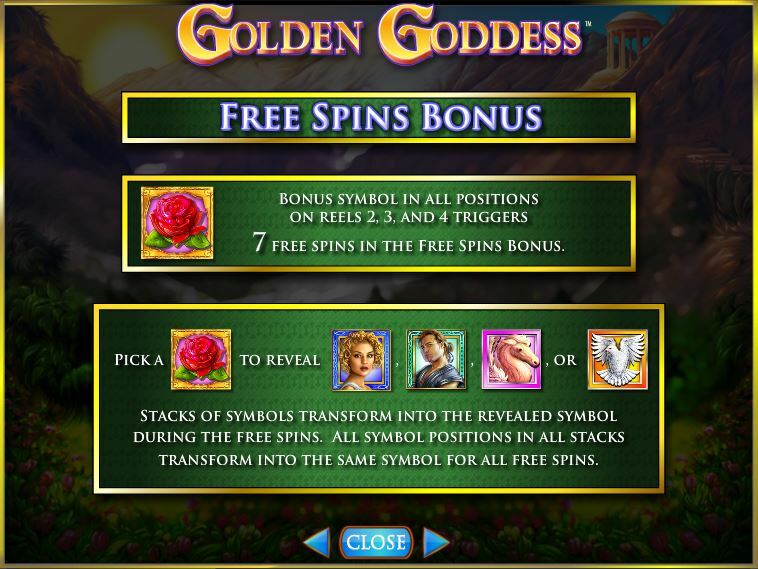 The stacks of symbols that come in during free spins will all turn into the symbol which was revealed. 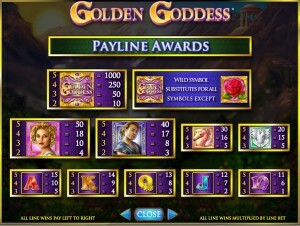 The smallest bet you can place in Golden Goddess is worth $40, so it’s not the kind of game that you can call cheap. The smallest coin value is $1, and you use one coin for each line. You have no option to change the number of active lines, so you always use 40 coins. The maximum denomination of a coin is $50, a very high value, which brings the maximum bet to $2,000. The game doesn’t give that much in return for the huge bets that you place in this game. You only get a 1,000x multiplier, so up to $50,000, but that’s with a $50 line bet. There is absolutely nothing wrong about the quality of the slot. Everything is excellently handled, with high quality symbols, especially when it comes to the main characters. Even the playing cards are nicely decorated, but the fact that they exist at all is a downside. The background image shows off a beautiful valley, with a Greek temple in a corner and with flowers everywhere else. Symbols: Golden Goddess Logo (1,000x, wild), Red Rose (scatter), Golden Goddess (50x), Man (40x), Horse (30x), White Dove (20x), Ace (15x), King (14x), Queen (13x), Jack (12x) and 10 (11x). The Super Stacks feature is a lot of fun, and you will find that the design is a pleasure to look at. Overall, it’s the kind of game that you will want to give a shot, if for no other reason than to be able to experience something new. 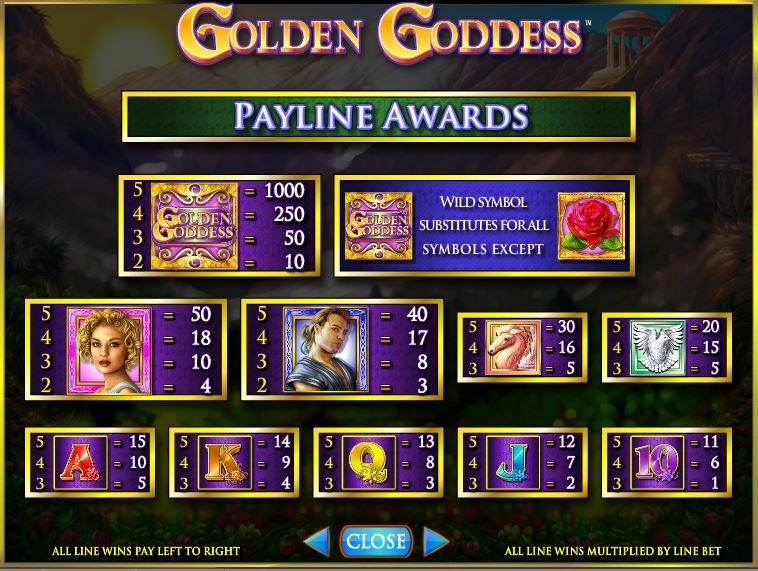 You will find Golden Goddess at any online casino which chooses to use software from IGT, playable either for free or for real money.